What better way to enjoy ice cream than with a drizzle of chocolate sauce on top? Chocolate ice cream sauce generally comes in a squeezy bottle and goes hard and crunchy when it comes into contact with the cold ice cream. Try it on vanilla, strawberry or mint ice cream. Or for a double chocolate hit, add it to chocolate ice cream. Chocolate and strawberries is a heavenly combination of two of the sweetest, most luxurious foods. 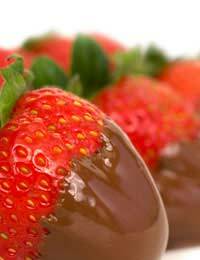 You can either top strawberries with melted chocolate or completely dip the strawberries in the chocolate. To start with, you need to melt the chocolate. Choose premium quality dark, milk or white chocolate and break it into small pieces in a bowl. Then, heat a saucepan of water and bring to the boil. When the water has boiled, remove the pan from the heat and place the bowl of chocolate over it, letting the steam from the water gently heat the bottom of the bowl. Stir the chocolate as it starts to melt, until it has fully melted. Meanwhile, prepare the strawberries. If you are simply topping a bowl of strawberries with melted chocolate then place the fruits in a bowl, washed, with their green tops removed. Once the chocolate is melted, simply pour as much as you fancy over the strawberries and serve immediately. Alternatively you could wait for the chocolate to set and eat the dish cold. To create chocolate-dipped strawberries, simply dip fresh strawberries in the melted chocolate until they are about ¾ covered and place them on kitchen towel to dry. It’s important to remember to make sure the fruit is completely dry, as even a tiny drop of water can cause the chocolate to curdle. Make sure the chocolate has set before you serve them. Placing the dipped strawberries in the refrigerator can speed up the stetting process. A chocolate fondue set will bring hours of luxurious treats to any occasion. The fondue sets come in a variety of designs, with the chief principal involving a vat of melted chocolate in which you can dip a variety of treats such as strawberries, marshmallows raspberries, blackberries, lady fingers, shortbread, biscotti, or meringues. Chocolate fondue sets are perfect for parties or for romantic nights in. A chocolate fountain is also a great way to involve chocolate in a celebration or special treat. Like chocolate fondue, the chocolate fountain involves melted chocolate, however it is kept at a permanent temperature and flows like a fountain. You can fill a glass with chocolate to drink, dip your chosen treat into the chocolate or even dip you head under and drink from the chocolate flow (although this can be a bit messy). You can hire chocolate fountain sets, they are popular for large functions such as weddings. Chocolate makes a great accompaniment to a variety of dishes, be it classic chocolate and strawberry combinations or something more inventive. Chocolate also makes a great accompaniment to nights in and parties. Quiz: What is Your Chocolate Personality? Quiz: Are You A Chocolate Addict?